Create your own friendship bracelets and charms! Stretch the rubber bands into any pattern you wish on the designer loom, then see your design in action on a 3D bracelet! You can switch back and forth between the loom and the 3D bracelet so you can see how each little tweak changes the bracelet. While looking at your 3D bracelet, you can rotate it around on the screen to see it from any angle. 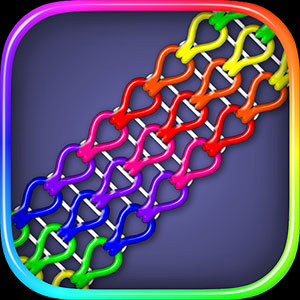 Rainbow Loom Designer is super easy to learn and to use for all ages. The loom detects which peg your finger is closes to, so the stretchy bands always snap into place on the correct peg. The undo button remembers all your moves, so it's easy to get rid of misplaced stretchy bands.